I had a great time with the wargaming at Gary Con as I always do. It's primarily a roleplaying game convention but with RPGing roots being in wargaming, there is plenty of that to be had. For my own part, I ran a Kingmaker (1974) game on Wednesday, as I have in the past, to get the ball rolling and closed out the convention on Sunday with out third annual Civilization (1980) game. For the four year running, John Appel led us in a game of Divine Right (1979). 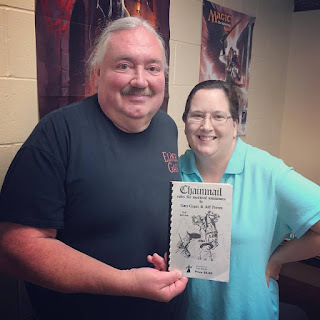 There was also another remarkable Chainmail (1971) LotR-themed game in which I played run by Kevin Cabai.